Dan Gillmor is giving a presentation at Loyola this week (register here). I wrote this review of his book and project Mediactive for Journalism & Mass Communication Educator 66(3), pp. 272-273 (2011). It’s no longer available online, so I’m reproducing it here. Journalism is broken, and with Mediactive, Dan Gillmor aims to fix it. 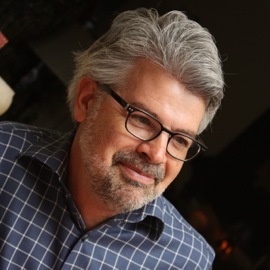 But he doesn’t start where you would expect – with a new financial model for the digital age. Gillmor offers a lightning tour of the tools and tactics a modern content creator can use to communicate; including tips on purchasing web domains, hosting, backing up data and setting up a content management system such as WordPress. He discusses the value of personal branding and how to gain influence through using these tools. This section is useful for anyone interested in joining the online marketplace of ideas, journalist or not. He closes the how-to section on a hopeful note, advocating entrepreneurial journalism and start-up thinking. Chapters on the law and teaching new media round out the book. 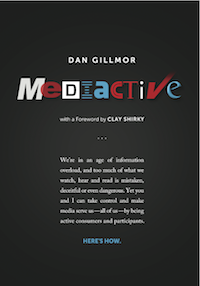 Writing about digital can be like walking on quicksand, so Gillmor has wisely made Mediactive much more than a book. The printed version (also available in Kindle and Nook formats) features underlined text to show links in the online version, at mediactive.com, where you can read the full text or download a .pdf. The site also features annotations, updates and Gillmor’s blog. The entire project is licensed under Creative Commons to facilitate sharing and exchange of ideas. Journalism is going through transformative change, and some institutions will fail. But it won’t be the end of journalism. Our economy is more information-dominant than ever. Barriers to entry have never been lower. Millions are publishing and gaining influence in their chosen spheres. And who knows? Out of these millions of seedlings may grow the New York Times of the future. If you want to participate in this dynamic marketplace of ideas, Mediactive is a useful guide that will speed your progress.